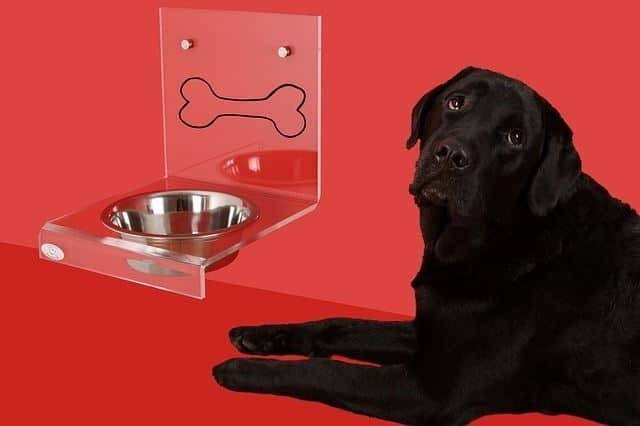 / What is The Best Dog Water Bowl in 2019? 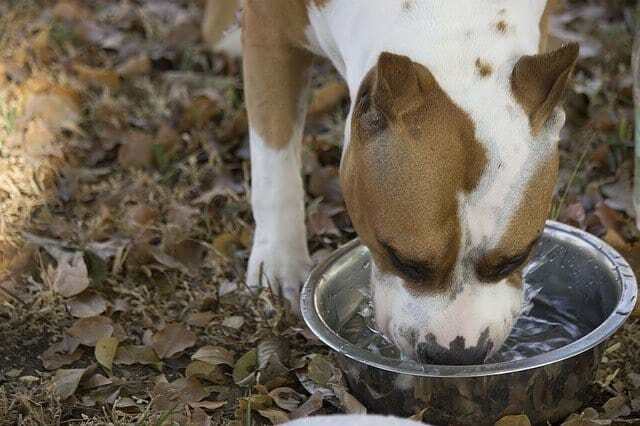 What is The Best Dog Water Bowl in 2019? Why Do Dogs Play with Their Water Bowl? How to Prevent My Dog from Playing with Their Water Bowl? How messy is your dog when he/she drinks water? 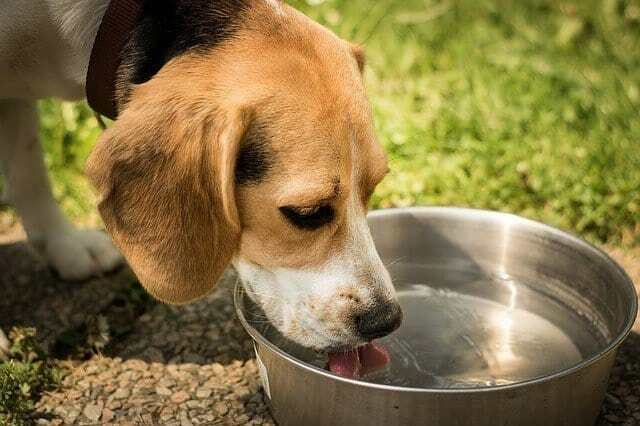 If your pooch is constantly making puddles when drinking water, it may just be time for a new bowl. 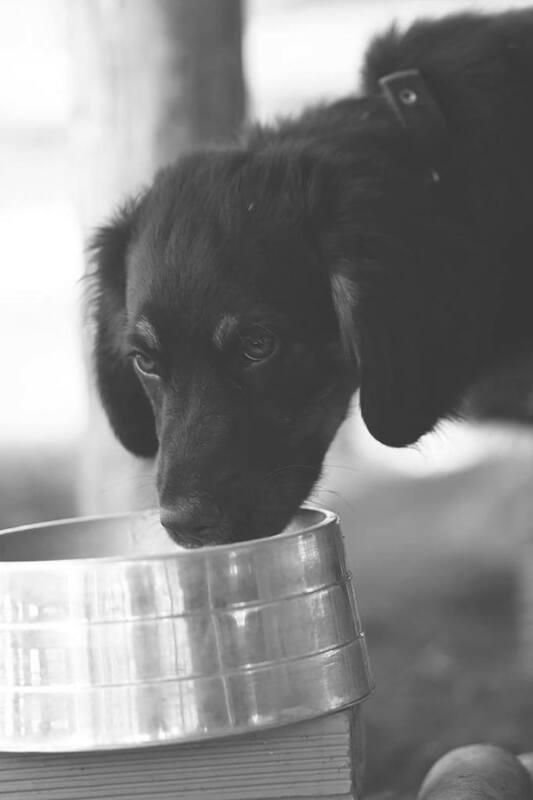 Believe it or not, a specific water bowl can make all the difference in how your kitchen looks after each time your pup is thirsty. Dogs can drink in so many different ways, and almost all of them result in puddles around the bowl. Some gulp while others push and it all just becomes a huge mess. Though cleaning a little water every day isn’t as hard, it can be quite inconvenient at times. So, what can you do? Continue reading to learn about the best water bowls for small and large breeds that the market has to offer. We’ll discuss their specifications, what makes them a good choice and also their pros and cons. Regardless of how big your pet is, its water bowl has to be sturdy, tough and non-slippery. You want the pup to be able to drink comfortably while creating as little mess as possible. The first thing you should consider is the material. You can choose between plastic, ceramic, stainless steel, and elevated dishes. While it’s up to you to pick the one that you like the best, keep in mind that stainless steel ones are probably the most durable. 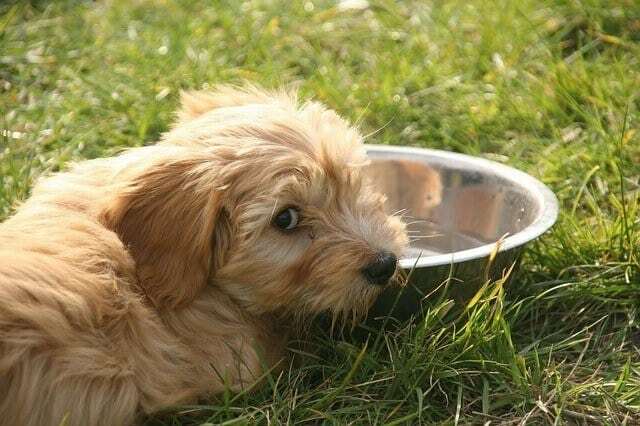 To prevent your pup from spilling any water, make sure its bowl is heavy enough. If you’ve got a big dog that always spills its water somehow, consider a heavier ceramic bowl or an elevated one. Regardless of the type you choose, you have to take proper care of it since it may develop stains or even rust if left outdoors. You can find more information on the different types in the text below. This AmazonBasics dog bowl is one of the best-selling models on the market. It’s made of stainless steel, so it’s suitable for outdoors as well as indoor use. You can also buy it for your cat and kittens. The material is resistant to rust, so it’s perfect for water as well as wet food. You can leave it outside when it rains, too. Its total capacity is up to 38 ounces. Most dog owners like this one because of its non-slip design. The AmazonBasics has a rubber base that prevents your pup from turning it over or sliding it around while drinking or eating. Plus, the rubber is gentle to your flooring, and it’s not damaging to any surface you put it on. While it looks simple, it’s a great alternative to plastic dishes that aren’t always as durable. This one is also dishwasher-safe making cleaning easier than ever. One of the best ways to prevent your pup from turning over its bowl is to fixate the dish to the floor. The Rozu dishes come in a set of two and are inside a non-skid silicone mat. The bowls are made of quality graded stainless steel. They are small which makes them perfect for small dogs and cats. The mat is made of food-grade silicone that’s also non-toxic and BPA-free. This design helps keep them in place, so they don’t slide around or turn over as easily. Each bowl has a capacity of 24 ounces and is resistant to rust. The stainless steel is also non-stick, so the dishes are fairly easy to clean even if you feed the dog from them. They are also dishwasher-safe for added convenience. Another stainless steel option is this Bergan dog bowl. It’s one of the most durable on the market that’s also not easy to scratch. This one comes in several sizes, so it’s suitable for both small and big breeds. You can choose from anything between a 3-cup to 17-cup size. Though this one is quite easy to clean with a bit of water and a cloth, you can also wash it in your dishwasher. The stainless steel construction is durable and doesn’t break as easily. The non-skid base at the bottom prevents it from sliding or turning over. Plus, because it’s as easy to clean, this one is also suitable for food. The vast selection of sizes allows you to buy one for each pet you have or buy the biggest for your pets to share. The 17-cup bowl fits into Bergan’s elevated feeding station. Bella Bowl by Loving Pets is an awarded dish and one of the best selling ones. This one is as pretty as it’s functional which is why pet owners often opt for it. It has a stainless steel interior inside a poly-resin exterior. The rubber base it comes with prevents it from sliding on your floor. It also eliminates noise especially if you use it outdoors. This removable rubber base is unlike any other because it’s soy-based, so it’s not as dangerous if your pup chews it. The stainless steel interior is bacteria resistant and easy to clean. It’s dishwasher-safe, but it’s also quite easy to clean by hand using a mild soap and a cloth. The rubber ring isn’t dishwasher-safe so make sure to remove it before washing the bowl. If you have an outdoor pet, you probably know the struggle of its water freezing. It’s annoying for both you and your pup, which is why you should consider this thermal bowl. The dish is thermostatically controlled and features a 5.5’ steel wrapped cord. It’s important to note that the cord, as well as all the electronics, is abrasion-resistant and safely sealed. It’s made of BPA-free plastic and uses only 25 watts. You can control the heat and turn it on and off when needed. You can’t wash it in a dishwasher, but you can clean it with a damp cloth. Detergent is also allowed but make sure to rinse the residue with care. Keep in mind that this one is certified by MET laboratories to exceed Canadian and USA safety standards. It comes in several sizes that range from 32 ounces to 1.5 gallons. One thing to remember is that large dogs need large bowls. They drink more water and unless you want to refill it every hour, get a slightly bigger one. Also, you want the heavy one. Big hounds have more straight and will most likely push around a very lightweight bowl. Big ones are the same as small and are made from various materials, so you get to choose which one suits you the best. Plastic is cheap but is also lightweight, and your dog won’t have any problems in flipping it over as often as possible. Ceramic is an excellent choice due to its weight but keep in mind that it’s porous and also easily breakable. Stainless steel is the most durable and probably the best choice for large breeds. If you find it too lightweight, you can add the bowl into an elevated feeding station. If you’re looking for stainless steel that’s scratch-resistant, you’ve found it. This dog bowl is made of the most durable stainless steel that’s impossible to break and quite hard to scratch. It features a thick rubber coating on the bottom for some added stability. Your pooch won’t be able to push it around nor will the dish make any noise if you use it outdoors. It’s stable and almost impossible to flip over thanks to the rubber ring. The entire thing is dishwasher-safe, even the rubber ring. If you want to, you can also wash it by hand using some mild detergent and warm water. The bowl comes in many sizes which is great if you also have a smaller dog. Some sizes are even available in a pack of two. The rubber ring doesn’t retain any odors and is not as easy for pups to chew or scratch it. Water bowls aren’t the most convenient things to keep in your bag unless they’re collapsible like the Bonza. This one is made of BPA-free plastic and is FDA approved. It’s built to last as it’s quite durable but lightweight. The best thing about it is that it doesn’t collapse when you fill it up with water as many other similar products. The Bonza comes in two sizes, a large and extra large so it’s perfect for bigger breeds. Large one fits about 4 cups while the capacity of extra large bowl is 7 cups. Also, it’s ideal for wet and dry food just as well. It comes with a water bottle holder attached to it that you can also remove if you want. This one is dishwasher safe, but it’s also easy to clean with just mild soap and warm water. This one comes in two sizes; 1.25 and 2.25 gallons. The best thing about it is that it’s super-stable since it has four wide legs. It comes in four different light colors. This giant bowl has high walls and a non-tip base. It will be hard for your hound to flip it over or slide it around, especially if it’s outdoors. The legs elevate it so it’s easier for large dogs to use it since they won’t have to bend all the way to the ground. All the walls of it are flat and high, so it fits into corners and against walls. It’s suitable for large pets only or if you have several dogs that would share their water. This one is made from plastic, but the walls are thick enough so your pup can’t break it as easily. This one is not only a functional water bowl; it’s also a super-stylish one. One of the best things about it is that it’s made of ceramics which also adds some style to it. 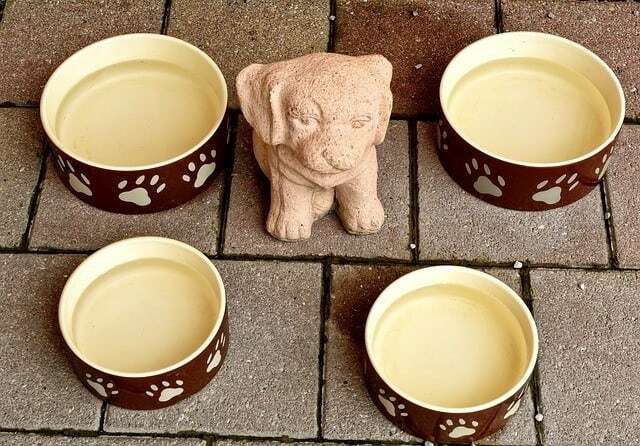 Handmade from 100% stoneware, the Pooch Basics is made to meet all the FDA standards. It’s cumbersome and almost impossible for your hound to move it around or turn it over. The bowl is dishwasher safe, but you can also just wash it with mild soap and warm water. It’s also suitable for wet foods because it’s microwave safe. It comes in only one color combination that is beige and black. The unique combo of colors, as well as the writing, makes it a stylish addition to your interior décor. The bowl is heavy so it might be hard for your dog to break it, but it wouldn’t survive you dropping it. Another ceramic choice is this Bone Dry pet bowl. It comes in different sizes with the larger one being suitable for medium to big hounds and cats. It’s FDA approved. The dish itself is made of porcelain ceramic and features a silicone ring at the bottom. The ring prevents it from sliding around, and it also reduced the noise your pup makes when using it. It’s dishwasher safe though it’s easy to clean with water and soap if you want to do it by hand. Just remember to remove the silicone ring if you do wash it in a machine. The printed design is quite attractive and is a nice addition to your décor. 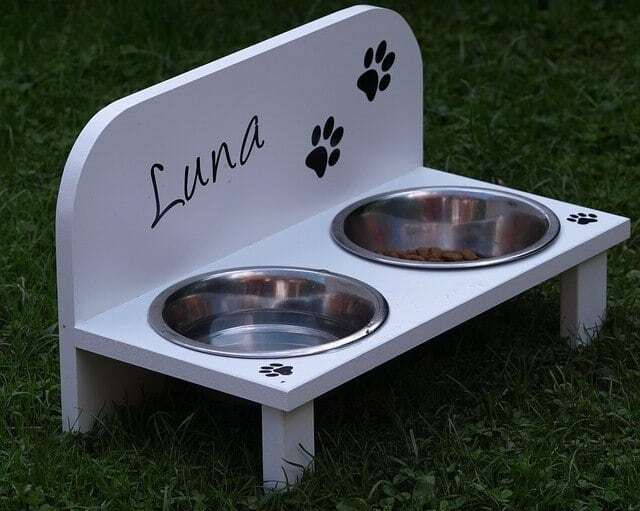 Plus, you can even feed your pup some wet food out of this dish. You can also choose if you want a round or a square one. Square bowls are available in a pack of two as well. As you can tell, there are many different types of bowls. Not only you can find several shapes and any color possible, but they also differ in the materials. Every kind has its own pros and cons so consider your personal needs and preferences when picking one. These come in many different colors and shapes. In most cases, they are quite affordable and unlikely to break. They can even be dishwasher-safe. However, these aren’t always the best choice for several reasons. If your dog tends to chew on its bowl, you might want to avoid those made of plastic. The material is also easy to scratch making it harder to wash. This might result in more bacteria building up in the type cracks. Also, your hound could end up with an allergy to the plastic which is why these should only be used as temporary solutions. These are the most stylish out of all the types we’ve mentioned. The material adds a certain dose of style, and most of them are also decorated with different designs. Some are even handmade. Most models have a protective glaze, so they don’t stain and are easy to clean. Many are dishwasher-safe and can also be used to warm your pup’s food in a microwave. Their most significant setback is that they break easily. Your canine maybe won’t break it, but it can chip it. Also, ceramic doesn’t stand a chance if dropped on the floor. These are the most commonly used and probably the most durable. Some models may even come with non-slip rubber at the bottom, so it doesn’t slide around your floor. Though it’s highly unlikely you’ll find any colorful options, these are inexpensive and will last you a long time. Most are dishwasher safe and even simple to clean by hand. Still, you have to take care of them just as well. Some bowls might stain or even rust if left outside. Plus, if your pup tends to chew on its bowl, it can damage the bowl and its teeth in the process. Because this is more about the stand than the dish itself, you can find ceramic, plastic and stainless steel options. The stand is usually made of plastic, metal or even wood. Many people believe that this is a much healthier option, especially for big dogs. Experts say that it helps prevent gastrointestinal problems. You should place them near a wall so your canine cannot tip it. Most elevated bowls are on a pricey side, but dog owners claim they are worth it. These also come in many different designs and look very good with any décor. These are most often just a plastic dish attached to a reservoir. Some can be used for water while others are better for food, but they all work in a similar way. They are designed to keep the bowl full at all times. Some models are programmable, and those are more suitable for food since they allow you to monitor your pup’s intake. 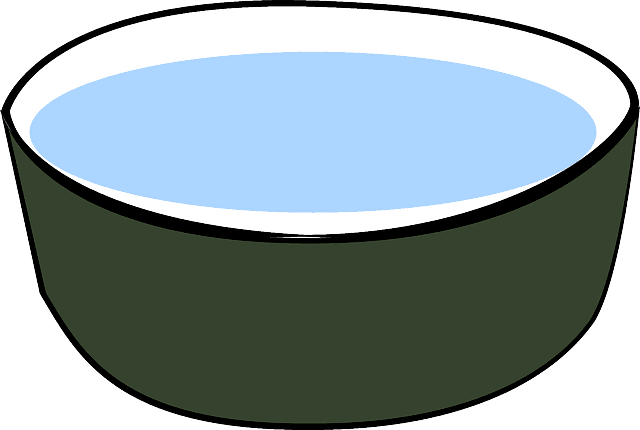 Non-programmable bowls are convenient for water if you’re often away for the majority of the day. However, keep in mind that the bowls as well as the reservoirs are usually made of plastic and might break easily. These are mostly made of durable materials that can withstand different weather conditions. Some outdoor dishes are specially made for low temperatures to prevent water from freezing. These work on electricity and have a thermostat for regulating the temperature of water. The best is to go for those made of thick plastic since those are the hardest to break and cannot rust if exposed to rain often. Many of the quality outdoors bowls are also ideal for traveling. Stainless steel isn’t suitable for outdoors because it’s most likely to rust sooner than later. 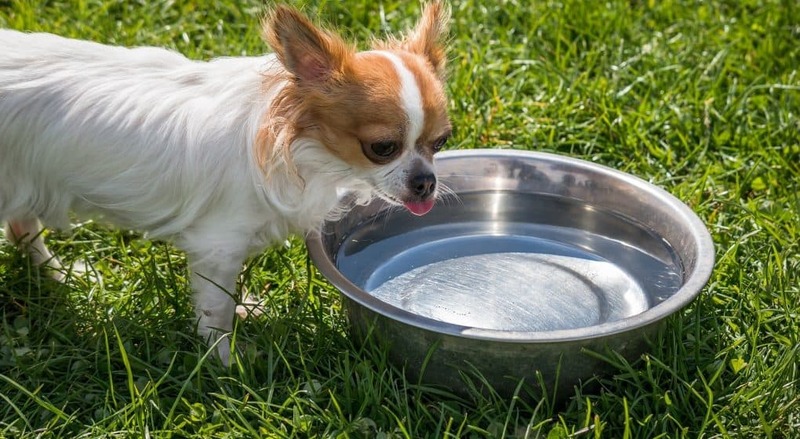 Your dog might play with its water for several reasons. If it’s hot outside and your canine just runs into its bowl, he/she may just be trying to cool a bit. Some dogs tend to put their paws in if they’ve been outside on hot grass, sand or concrete. Others just like to play with it for pure fun. While some breeds may enjoy being bored and lazy, others will find fun and games anywhere. So, canines find splashing water rather fun at times. If your dog is doing this to cool, you shouldn’t forbid it. Although, because it probably makes a mess in your kitchen every time you return for a walk, consider buying a plastic kiddie pool. Put the pool outside and let your dog play and cool whenever he/she wants to. If the pup is doing this out of boredom, then just find another way to provide entertainment. Buy some dog chewing toys and interact with your pet, so there’s no room for boredom. Going out for a walk or a run (make sure you have a harness for running) is also a good idea. Another thing you can do is get a food release toy. When hounds play with their water to get your attention it’s essential you ignore the behavior at first. Praise its good behavior as it approaches its water, but stop and leave the room once the paws are in. If none of these work, it might be best to consult a trainer. Water is essential for everyone’s health, so it’s also crucial your pup has it at all times. This is why you have to choose its bowl wisely. The last thing you want is for your dog to be dehydrated from water. Probably the most critical factor to consider is durability. It’s crucial you find the one that will last you a long time and look good throughout. Other than that, everything else is entirely depending on your preferences and needs. 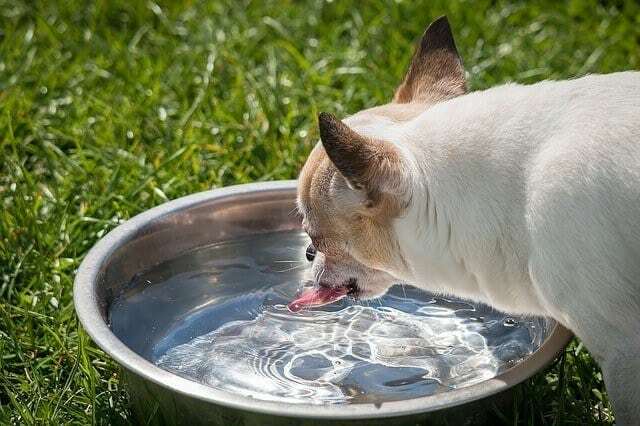 Each type of water dish has its perks and setbacks, so it’s just a matter of finding which works the best for you and your pet. Think about the breed you have as well as how it behaves with its bowl to make the best choice.